When Prince Harry and Meghan Markle travelled to Botswana in August, their first stop was the camp Meno a Kwena, to celebrate the eve of Markle's 36th birthday. This camp is certainly a favourite of the royals and Harry has visited on numerous occasions, including with his previous girlfriend, Zimbabwean Chelsy Davy, in 2007. Meno a Kwena is an authentic old-style safari camp, full of character and adventure. Situated on a cliff edge overlooking the Boteti River, the camp offers superb views and fascinating walking tours with the indigenous locals – the afternoon bushman walk is not to be missed. 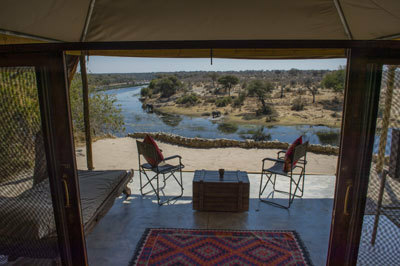 The nine en-suite tents may not be so luxurious as to be termed “regal”, but they are certainly comfortable and well designed – you can watch elephant and zebra drinking from the river without leaving your bedroom. For longer stays here, the camp offers game drives, meerkat spotting, scenic flights over the Makgadikgadi salt pans, mobile camping, and conservation safaris. Mombo Camp, part of the Wilderness Safaris collection, offers arguably some of the best big game viewing in Africa. Located in the Okavango Delta on the north-west tip of Chief's Island, Mombo is absolutely ideal for a conservation-conscious royal holiday and has just been remodelled. This month, each tented room of the uber-luxurious flagship camp has been demolished and rebuilt in exactly the same place, ensuring that minimal ground is disturbed and allowing the vegetation to remain. A tree expert was even brought into the camp to make sure not one tree was hurt in the rebuild! The camp also full-heartedly supports Wilderness Safaris' massive conservation efforts. Going beyond recycling policies and solar power (though their lodges have this and more), Wilderness Safaris is leading the efforts in reintroducing locally extinct black and white rhino to the wild in the Okavango Delta and has just completed one of the largest cross-border moves ever. With recycled “twisting” balustrades, boardwalks that weave so as not to disturb the elephant pathways, and divine en-suite tents with private verandas, this is definitely a lodge in which we'd just die to be proposed to, by a conservation-conscious prince. One of the many draws of Botswana's northern territory is the waterways that make up the Okavango Delta. The main watercourse that supplies the Delta is called the Panhandle, a stretch of 70km of the Okavango River that flows fast and deep and is ideal for fishing. Sitting on an island in the Panhandle is one of the oldest lodges in the area, Nxamaseri Island Lodge. Visited by Prince Harry in his earlier years, this small and lesser-known lodge is tucked away in the indigenous forest and has just seven chalets, each with a private deck overlooking the river. The usual Delta activities can be enjoyed here, from birding safaris (there's an excellent colony of carmine bee-eaters nearby) to mokoro trips. However, with its prime position by the barbel run and first-rate fishing experts on hand, this lodge should be thought of as a specialist lodge rather than a big-game safari property. Harder to get to, smaller, and providing a more realistic and immersive Botswana stay… we can see why Prince Harry chose Nxamaseri! Like Wilderness Safaris, Great Plains Conservation is a force to be reckoned with when it comes to eco-luxury camps forging conservation policies and efforts. Alongside industry partners &Beyond and Rhinos Without Borders, Great Plains Conservation has undertaken a relocation of rhinos on a magnitude never before achieved. With a goal of moving 100 rhino from South Africa to safe havens in Botswana, the initiative is ongoing. However, so far 77 rhino have been moved from high-density populations, which are attracting more and more poaching, to low-density areas with the best anti-poaching record on the continent. In true Prince Harry fashion, the Great Plains property Selinda Explorers Camp combines a love of Botswana, a passion for adventure, and support of the phenomenal wildlife conservation to meld one of the greatest camps in the whole country. Selinda Explorers Camp is exceptionally intimate, with just four Meru-style canvas tents located on a remote stretch of the Selinda Spillway. The property's wildlife-viewing activities (guided walks, canoe trips, and game drives) are definitely the main focus thanks to the knowledgeable guides. To turn a memorable stay into an adventure of a lifetime, Selinda Explorers Camp could be combined with a five-day journey down the Selinda Spillway as part of the Selinda Adventure Trail. Days on the trail are spent spotting wildlife in the predator-rich Linyanti Reserve, with nights whiled away eating under the stars and sleeping in impromptu fly camps – a similar jaunt to Prince Harry and Meghan Markle's experience in August. We couldn't mention Great Plains Conservation without bringing up Zarafa Camp. Zarafa is the pinnacle of what happens when everything comes together perfectly. As described by Great Plains, it's “the culmination of a lifetime's experience, built with grace and love in honour of an incredible wilderness”. An intimate, unspoiled, and welcoming camp, Zarafa may have a high price tag but it is worth it for sure. There are just four marquis-style tents with lots of canvas windows and a private balcony. The doors are reclaimed from Zanzibar, the floor is made from reclaimed railway sleepers, and the furniture is made of wood from areas destroyed in the 2004 tsunami. The bathroom has a copper bath, and there are both inside and outside showers. The overall effect is fabulous and environmentally innovative, and may be the “greenest” luxury safari camp on the continent. Zarafa Camp is also a member of Pack for a Purpose, a not-for-profit organisation that encourages guests to reserve a few pounds of space in their luggage for supplies for the Conservation Education Programme and Women's Craft Groups, making a priceless impact to the lives of local children and families. We are sure this'll get a “thumbs up” from a prince. For further information, visit yellowzebrasafaris.com.